Jordan prides itself on its advanced education system. Jordanians are well educated since education is considered a core value in Jordanian culture. Jordan has the highest ratio of researchers in Research and Development among all 57 Organisation of Islamic Cooperation (OIC) member states. In Jordan, there are 8060 researchers per million people, higher than the EU average of 6494, and much higher than the world average of 2532 per million. Jordan provides a higher proportion of its public budget for education than most countries in the world. In 2003, the share of the budget allocated to education was 6.4% of total government expenditure; education spending as a percentage of GDP was 13.5% in the same year. Jordan had one of the highest literacy rates in world at about 97.9% in 2012, which increased to 98.01% in 2015, and is expected to reach almost 100% by 2020. The primary gross enrollment ratio has reached 100% by 2007 for both girls and boys combined. The primary to secondary transition rate has reached 98.79% as of 2013, and the rate of transition to higher education is 85% of secondary school graduates. Along with these high enrollment and transition rates, Jordan has achieved a full parity in all education levels since 1999 and has maintained that parity since then. On the sub-indices for enrollment in secondary and tertiary education, Jordan ranked number one out of 142 countries. Jordan is ranked 80 out of 188 in the Human Development Index. Despite strained resources, the Ministry of Education developed a highly advanced national curriculum and many other nations in the region have developed their education system using Jordan as a model. Jordan ranks number one in the Arab World in education. The Jordanian Ministry of Education is now making it mandatory for students to be computer literate and able to apply their studies in computers to their regular studies, most especially the scientific and mathematical courses. Jordan's educational system meets international standards and its secondary education diploma is accepted in world-class universities. The recent education reforms started in the early 1990s. This reform process was accelerated under His Majesty King Abdullah II in early 2001 with a vision to make Jordan the regional technology hub and an active player in the global economy. The National Vision and Mission for Education, as developed and endorsed in late 2002, states the desired direction for general education in the country. The two major consultative documents, that helped shape the national vision and also set directions for educational reform initiatives, were Jordan Vision 2020 and the 2002 Vision Forum for the Future of Education. These documents spanned kindergarten to lifelong continuing education. The overall strategy proposed by the Forum was endorsed by the Economic Consultative Council (ECC) in October 2002. The national development strategy and the Forum results were consolidated into specific development plans, the Social and Economic Transformation Plan, the General Education Plan 2003-08. In July 2003, the Government of Jordan launched one of the most ambitious programs in the entire MENA region, a 10-year multi-donor Education Reform for the Knowledge Economy Program (ErfKE) for which the World Bank provided US$120 million. The goal of the program was to bring the country's educational policies and programs in line with the demands of a knowledge based economy, improve the physical learning environment in most schools, and promote early childhood education. The first phase of program lasted from 2003–2009, closing in June 2009. The second phase of the ErfKE, which is aligned with IBRD and IFC Country Assistance Strategy (CAS) for the Hashemite Kingdom of Jordan, lasted from 2009-2015. The aim of this program was to strengthen and institutionalize the reforms introduced under ERfKE I, with a particular focus on school level implementation and teacher quality. It will strengthen the institutional capacity of MoE in policy, strategic planning, monitoring and evaluation, and improve teacher employment, utilization and professional development policies and implementation. The program also aimed to fine tune the curriculum and student assessment to ensure alignment with a knowledge based economy. Jordan Education Initiative recently received the UNESCO prize for ICT use in Education. This pioneering educational project aims to utilize the power of information and technology with the proven methods of learning to transform the learning environment in schools. The Ministry of Education (MoE) is responsible for the pre-primary, primary, and secondary levels of education. Post-secondary education is the responsibility of the Ministry of Higher Education and Scientific Research (MoHESR), which includes the Higher Education Council and the Accreditation Council. The MoHESR has outlined a National Strategy for Higher Education for the years 2007-2012. Technical and Vocational Education and Training (TVET) at the post-basic level (excluding community colleges) as well as applied vocational education, administered by the Vocational Training Corporation (VTC), is under the authority of the Ministry of Labor. The structure of the educational system in Jordan consists of a two-year cycle of preschool education, ten years of compulsory basic education, and two years of secondary academic or vocational education after which the students sit for a General Certificate of Secondary Education Exam—Tawjihi. Basic Education is free of charge, and so is secondary education in public schools. Basic Education is a 10-year compulsory and free level of education (grades 1-10). Study books are standard books distributed by the Ministry of Education. Education is compulsory for all through the age of sixteen. More than half of the Jordan population is below the age of 30 years. About 42.2 percent are 14 years or younger, whereas 31.4 percent fall between 15–29 years of age; almost one-third of the Jordanians are enrolled in educational facilities. As of 2007/2008 the gross primary enrollment rate is 100% which is higher than the regional average of 93%. Jordan also ensures a full level of gender parity in access to basic services, It is also one of the few Arab countries that have very small disparity in primary school attendance rates among urban and rural areas. This is mainly because public financing for basic schooling is more pro-poor than that for any other education level. Schools in Jordan have two main categories, government and private. The private education sector accommodates more than 31.14 percent of the student population in the capital of Jordan, Amman. This sector is still heavily taxed, up to 25%++, although it takes a high burden off the government of the Kingdom, which makes school fees relatively high, starting at $1000, and going up to $7000. These values for private education fees are extremely high when compared to the average family incomes. Secondary education (managed by the Ministry of Education), which can either be academic or vocational. At the end of the two-year period, students sit for the general secondary examination (Tawjihi) in the appropriate branch and those who pass are awarded the Tawjihi (General Secondary Education Certificate). The academic stream qualifies students for entrance to universities, whereas the vocational or technical type qualifies for entrance to Community Colleges or universities or the job market, provided they pass the two additional subjects. Applied secondary education (managed by the Vocational Training corporation), which provides intensive vocational training and apprenticeship, and leads to the award of a certificate (not the Tawjihi). Practical training is made through apprenticeship, and not in school workshops as in vocational secondary education. Primary to secondary transition rate has reached 98.79 % as of 2013, The enrollment in secondary vocational education as a share of total secondary enrollment declined from 18 percent in 2000 to 12 percent in 2005. In international assessments, such as TIMSS and PISA, Jordan has performed well in comparison to other countries, Trends in International Mathematics and Science Study (TIMSS) Report in 2003 ranked Jordanian students' scores to be 22 points above international average in science and mathematics. Since tertiary education is not free, the rate of transition to tertiary education is highly correlated with family incomes; there are 3 times more students at the university level from families in upper two income quintiles than those from families in the lower three. The United Nations Relief and Works Agency for Palestine Refugees in the Near East (UNRWA) operates one of the largest school systems in the Middle East which has provided basic and preparatory education to Palestinian refugees for nearly five decades. The Agency provides basic education free of charge to all Palestinian refugee children in its area of operations, which includes Jordan. There are also vocational training courses provided in eight training centers, two of which are in Jordan, and have been in operation for the past four decades. The Agency has established an Institute of Education, which is headquartered in Amman, to provide training to the UNRWA teaching staff. *Enrollment figures of refugee pupils in government and private schools are believed to be incomplete, since refugee pupils lack incentives to report their status if and when requested. Just over 2.5% of Jordan's total population is enrolled at university, a proportion comparable to the United Kingdom. Access to higher education is open to holders of the General Secondary Education Certificate who can then choose between private Community Colleges, public Community Colleges or universities (public and private). The credit-hour system, which entitles students to select courses according to a study plan, is implemented at universities. Higher education system of the country has evolved considerably. In years between 2000/2001 and 2006/2007, Jordan has seen an increased demand for higher education with enrollments growing at an annual rate of 14 percent from 77,841 to 218,900 students. It has tertiary gross enrollment levels of about 40 percent which is higher than the regional average. Three new public universities have been established recently reaching a total of 10 public universities in the country. Private universities have seen a rapid increase in enrollments as well. Since 2000 to 2006, enrollment in 12 private universities grew by about 18 percent annually from 36,642 to 55,744. However, enrollment numbers in community colleges declined from 30,000 to 26,215. This decrease in enrollment rates reflect a bias to a 4-year university education and also the fact that quality and level of training given in these colleges is not what is in demand in the labor market of a knowledge based economy. With increasing number of students going for the attainment of higher education, the government needs to allocate greater resources in improving the current higher education system and also to improve access of good universities for the rising population. Even the private universities have to change some of their admission policies. The enrollment cap in the private universities restricts the ability of university to absorb increasing number of higher education students. Projection for the number of students entering university is 92,000 per year by 2013 up from 50,469 in 2005. Most universities in Jordan follow the English-American education systems and are associated with many American and English universities. Bachelor's Degrees normally take four years. In Dentistry, Pharmacy and Engineering, studies last for five years. In Medicine, they last for six years, followed by an Internship which lasts for one year. The bachelor's degree requires a total of 126-257 credit hours, depending on the field of study. A Master's degree is awarded after a further one to two years' study following a bachelor's degree. It can be obtained either by course work and a thesis (c. 24 credit hours of courses and nine credit hours of research), or by course work (c. 33 credit hours) and a comprehensive examination. There are other postgraduate degrees equivalent to the master's degree in some Jordanian universities like the Magister in the German Jordanian University, the DEA's degree in the Universities which follow the French system and the MBA for the students who have significant work experience. A Doctorate Degree is awarded after three to five years of further study and the submission of an original dissertation. It requires, depending on the subject, 24 credit hours of course work and 24 credit hours of research. Basic schoolteachers must hold a bachelor's degree. Training of secondary school teachers: Secondary school teachers must hold a bachelor's degree and a one-year postgraduate Higher Diploma in Education. Training of higher education teachers: They must hold a Doctorate (PhD). In some cases a master's degree is sufficient. This type of education is offered at the newly established branch of the Arab Open University. Non-university and vocational studies are offered in community colleges, access to which is open to holders of all types of general secondary education certificates. The two-to three-year programme encompasses many fields, such as Arts, Science, Management, Business Administration and Engineering. As of 1997, all public Community Colleges are under the supervision of Al-Balqa Applied University. At the end of the two- or three-year course, students sit for a comprehensive examination (Al-Shamel). Those who pass are awarded the associate degree / Diploma. Lifelong education is offered at public and private universities, public and private community colleges, the Jordan Institute of Public Administration, The Royal Jordan Geographic Center and The Royal Scientific Society, as well as in other institutions. Courses are offered in Engineering, Industry, Agriculture, Foreign Languages, Computer Sciences, Managerial Sciences, Secretarial Studies, Physical Education and subjects that can help the local community. Courses last between one week and six months at the end of which students obtain a Certificate of Attendance or Achievement. The qualifications required for admission depend on the subject and level of the course. Some are designed for specific occupations, in which case a work experience in the relevant field is needed to attend such courses, such as the books of Nadia Saqer. Jordan, despite showing impressive improvement in the education system, continues to face persistent problems in this sector. With a rising youth population, the Jordanian government has to ensure that the quality of education and level of skills imparted can help the new generation to compete effectively on a national and international scale. Currently, the biggest challenge is the increase of population due to refugee influx, which has put pressure on Jordan's schools and universities. A recent school utilization study indicates that the number of Ministry of Education students is expected to increase by 124,634 between 2008 and 2013. To accommodate the rise in students, additional 3,360 classrooms will be needed during this time period. The same study reveals an uneven provision of educational infrastructure. In the Kingdom there exists concurrently excess capacity and wide-scale overcrowding of the schools. 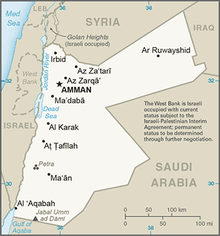 ^ "Country Profile: Jordan". UNESCO. Retrieved 2018-02-24. ^ a b "Jordan". UNESCO. Retrieved 2018-01-24. ^ a b "2015". UNDP in Jordan. Retrieved 2018-01-24. ^ "World Bank 2009. "Education Reform for Knowledge Economy II Project." Project Appraisal Document.pp4" (PDF). ^ "USAID in Jordan 2009". ^ "World Bank MENA external website". ^ "World Bank 2003.Education Reform for Knowledge Economy I, Project Appraisal Document(PAD)" (PDF). ^ a b c "Vocational Education in Jordan". UNESCO-UNEVOC. November 2012. Retrieved 2 June 2014. ^ "Government of Hashemite Kingdom of Jordan". ^ "World Bank. 2009. "Education Reform for the Knowledge Economy II." Project Information Document. World Bank, Washington ,DC" (PDF). ^ "World Bank. 2009. "Education Reform for the Knowledge Economy II." Project Information Document. World Bank, Washington, DC" (PDF). ^ "United Nations Relief and Works Agency(UNRWA)". ^ "Rough Guides -". Rough Guides. ^ "World Bank 2009. "Higher Education Reform for the Knowledge Economy Project." Project Appraisal Document. World Bank. Washington, DC" (PDF).